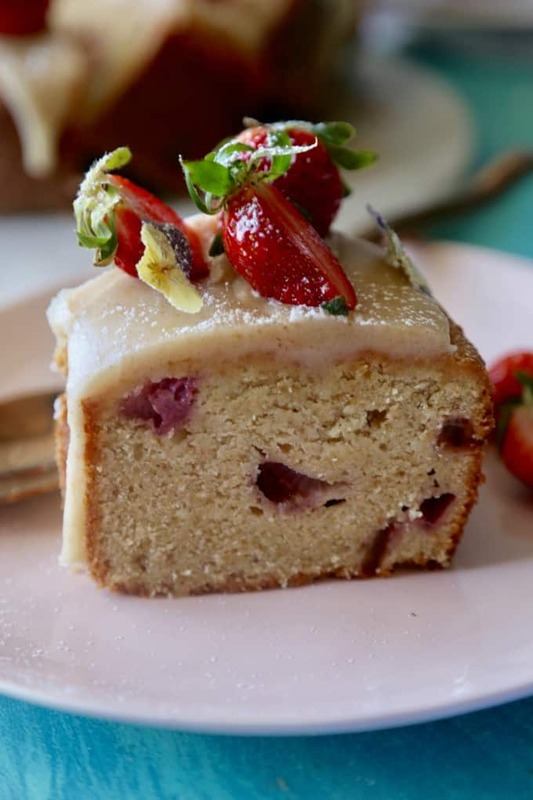 This Gluten Free Strawberry Cake may be free of gluten, but it is bursting with flavor! 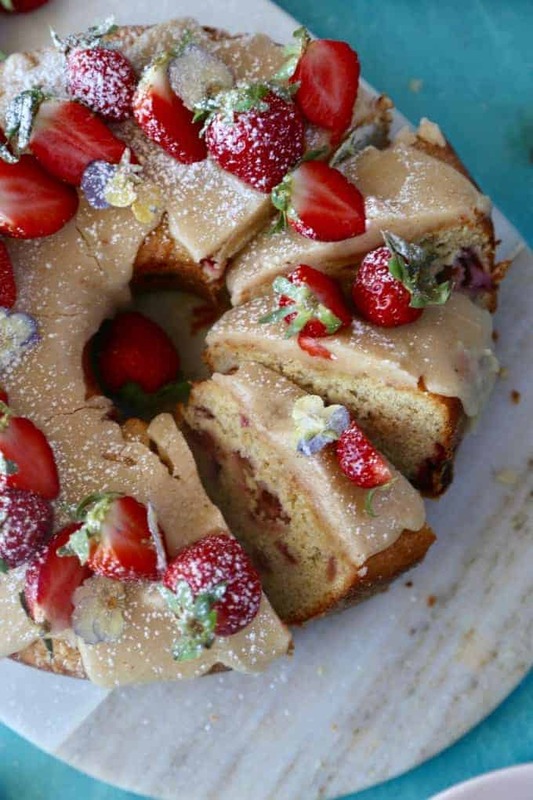 It’s a gluten free strawberry bundt cake topped with a brown butter glaze, sliced strawberries, and powdered sugar. Strawberry season is upon us, which can only mean one thing. Lots of strawberry eating and lots of strawberry recipes. I assure you that not a single person in my household is complaining about this glut of strawberries and strawberry recipes. 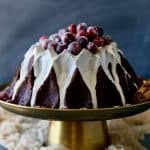 If you’ve spent any time on my blog, especially perusing the archives, it’s pretty clear that I have a thing for strawberries and bundt cakes. (Case in point: my recent recipe for Strawberry Mini Bundt Cakes.) 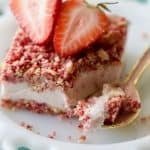 But this Gluten Free Strawberry Cake is one of my favorite recipes. That is saying a lot! 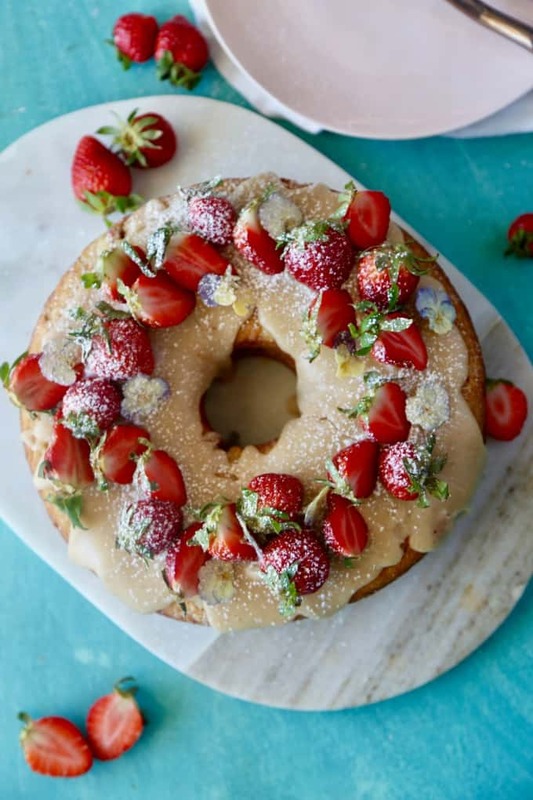 The strawberry-filled bundt cake is dense like a pound cake but full of flavor, and it’s topped with the very best brown butter glaze. 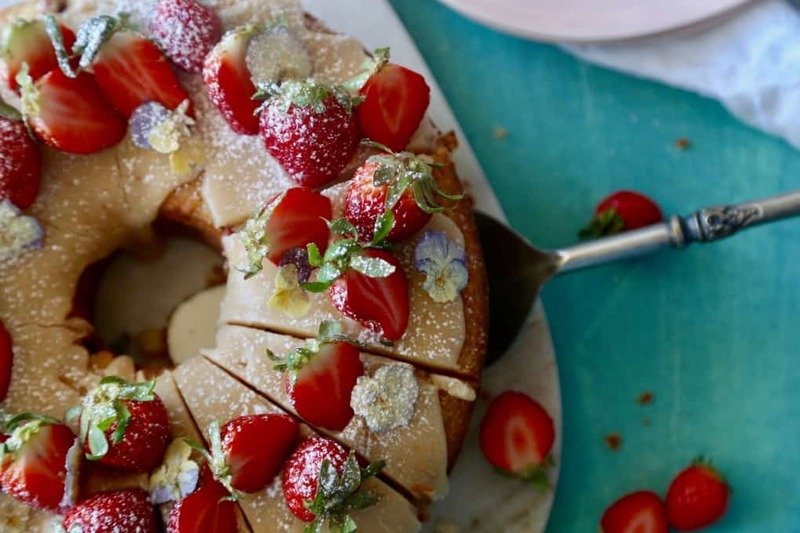 Garnished with sliced strawberries and a dusting of powdered sugar, it is simply cake heaven. The fact that it is gluten free is just… well, icing on the (gluten free) cake. It used to be that gluten free baking meant suffering through really crummy baked goods, but no more! Gluten free baking can be just as good as baking with gluten, if not better. 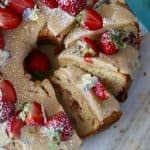 This post isn’t sponsored; I just really love these brands for this Gluten Free Strawberry Cake recipe! Gluten free flour: My favorite is Premium Gold Gluten Free Flour, and I highly recommend it. Look for it online if you can’t find it locally — it’s worth the extra effort! 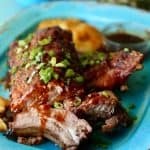 I have tried many gluten free flours, and I’ve found that a lot of them are a bit too potato-y for my liking. (Potatoes are indeed gluten free, but they don’t exactly add the best flavor to baked goods.) The Premium Gold Flour uses a flaxseed base that pairs perfectly with the strawberries. Yogurt: I use my favorite Greek Gods Strawberry & Honey Yogurt in this recipe. It adds moisture and makes the cake extra strawberry flavored and sweet. I’m able to use less added sugar because of the yogurt. If you can’t find this exact yogurt in your area, look for something similar. 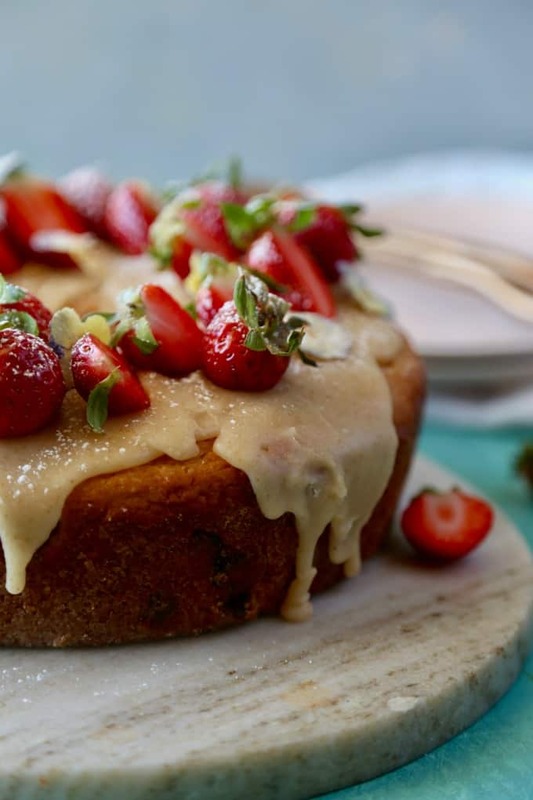 A delicious cake that combines fresh strawberries and a decadent brown butter glaze. Preheat oven to 325 degrees. Grease and flour a 10-12 inch bundt pan. In a large bowl whisk together flour, baking soda, and salt; set aside. Cream butter and sugar until light and pale. Add eggs, one at a time, beating throughly before each addition. Add yogurt and milk and beat until just combined. Stir in flour mixture. Batter will be thick. Spoon batter into bundt pan. Bake until cake top is golden brown and a knife is inserted and comes out clean, about 55-60 minutes. Cool pan for 5 minutes then invert cake (turn over) onto cooling rack to cool completely. Once cake has cooled, make glaze. 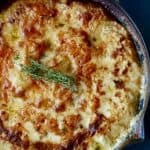 To make the glaze heat butter over medium high heat in a small pan, stirring constantly, until just golden brown, about 7 to 10 minutes. Immediately remove from heat. Add powdered sugar, vanilla, and milk directly into pan and whisk until smooth. Oooohhh…. 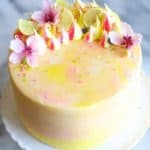 I’ve been gluten free for three weeks now and I’m so excited to try gluten free baked goods and this cake looks PERFECT for Easter dinner.